Both Sides Can Claim Some Money Advantage In Presidential Race : It's All Politics New reports from the presidential campaigns show that Republican Mitt Romney last month widened his cash advantage over President Obama. But the numbers reported to the Federal Election Commission paint a more complex picture of the race and the vast amounts of money fueling the campaign. 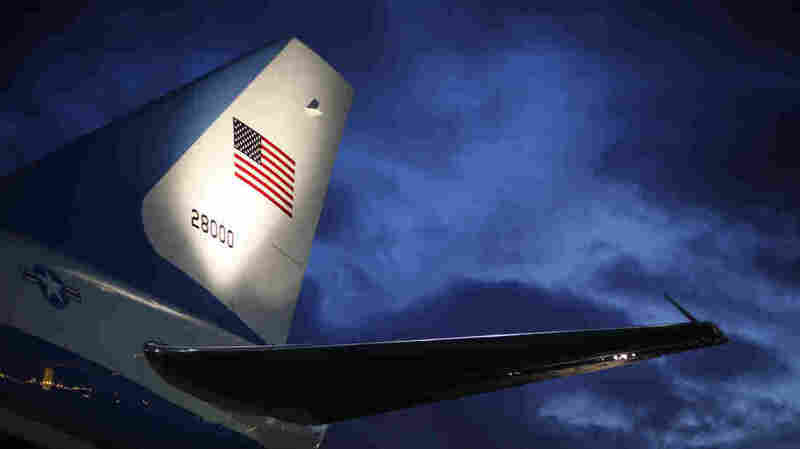 Air Force One is parked at John F. Kennedy International Airport before President Obama's July 30 departure from New York City, where he was attending a private fundraiser. New reports from the presidential campaigns show that Republican Mitt Romney last month widened his cash advantage over President Obama. But the numbers reported to the Federal Election Commission paint a more complex picture of the race and the vast amounts of money fueling the campaign. The Obama campaign committee, Obama for America, reported raising about $39 million, almost $11 million more than was raised in July by the Romney campaign committee, Romney For President. But when you add in the rest of each candidate's organization — the national party and joint fundraising committees — Romney easily outran Obama and once again increased his advantage in cash on hand. "Romney has a 3-to-2 advantage in cash, today," says Michael Malbin, director of the nonpartisan Campaign Finance Institute. But "if you just look at the candidate committee by itself, Obama has a 3-to-1 advantage." And candidate-committee money is more versatile than other money. So the Obama campaign could spend big, early on for field operations. It has 32 offices in Colorado; Romney has 10. In Iowa, it's 17 Obama offices to 11 for Romney, as the Republican races to catch up. But meanwhile, other dollars are flooding into TV stations: $350 million in 10 battleground states since May 1, according to an NPR analysis of advertising data compiled by National Journal. The Obama campaign is outspending the Romney campaign better than 2 to 1. But overall, 56 percent of the ad spending is pro-Romney. That's mainly because of secretly financed "social welfare organizations." The biggest spenders — Crossroads GPS, which has Karl Rove as an adviser; and Americans For Prosperity, which is backed by the billionaire Koch brothers. Malbin says it's too soon to say which will win out, the TV ads or the ground game. But he does say both candidates are chasing big donors at the expense of voters, and the campaigns know it. "Every day that Romney goes to Texas or Obama goes to New York [on fundraising trips, rather than campaigning], it's bad for the campaign. It's good for the money. But they would rather have them in Virginia, Florida or Ohio. " And so far, it seems that neither candidate can walk away from the prospect of big bucks.